Earlier this month the government published a consultation into whether organisations should be required to report on the pay differentials between people from different ethnic backgrounds. Kate Hodgkiss from DLA Piper considers how the proposals might impact employers if they become reality. In her Race in the Workplace review last year Baroness McGregor-Smith said that “no employer can honestly say they are improving the ethnic diversity of their workforce unless they know their starting point and can monitor their success over time”. Now, following the implementation of mandatory gender pay gap reporting in April 2017, the government this month published its consultation paper on ethnicity pay reporting. The McGregor-Smith review suggested that full representation of minority groups across the labour market could result in an increased output of around £24 billion to the UK’s economy. However, the consultation raises a number of questions concerning which employers the obligation should apply to, how the data should be reported and the methodologies to be employed in collecting data. It also contains notable gaps and hurdles that will need to be overcome before such a reporting obligation is genuinely feasible. An important additional consideration is how to balance obtaining the most comprehensive and valuable data against the significant burden on employers that a reporting obligation would impose. Which employers may be affected? The government’s suggested threshold for a mandatory reporting obligation is an employer of 250 people of more, which reflects the gender pay reporting requirements. The government has not followed McGregor-Smith’s recommendation of a threshold of 50, reasoning that the resource and expense required to comply would create too large a burden for smaller employers. That said, views are being sought on the appropriate size of employer, with options ranging from 50+ employees to 500+ employees. Which reporting methodology is most appropriate? A key focus of the consultation is, once collected, how ethnicity pay information should be reported. This balancing act between providing easily digestible information, while also demonstrating that the complexity of ethnicity data is being properly considered, is of vital importance. While it is easily the most digestible and familiar of formats, being comparable with the gender pay gap methodology, the first option would result in a significant lack of context. The second option is a slight improvement, but would still fail to visibly reflect the complexity of the data, particularly as each ethnic minority group’s pay is, again, only being directly compared with the pay of white employees. The third and fourth options are preferable from a data perspective, with each ethnic group representing a percentage of a pay band or quartile, and therefore allowing an ethnic minority group’s pay data to be directly compared to not only white employee’s pay data, but other ethnic minority groups’ data too. Another advantage of this methodology would be the ability to ascertain where different ethnic minorities are concentrated within a business and therefore ask the question why. Given that it will be vital to contextualise this form of data in order to report clearly on the ultimate pay difference splits across a business, reporting in quartiles does have advantages, but these must be framed against the increased burden on employers. 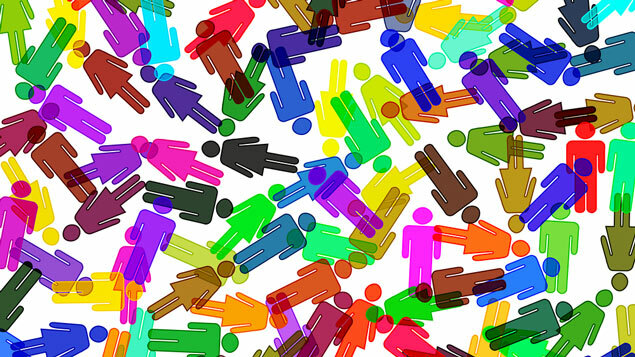 Despite research from the Equality and Human Rights Commission (EHRC) showing almost two thirds of employers with more than 250 employees collect ethnicity data, there is no legal obligation for individuals to disclose which ethnic group they identify with. This makes it difficult to obtain a useful dataset, primarily due to an individual’s association with a specific ethnic group being subjective. Employers that have previously collected ethnicity data have, undoubtedly, done so differently and with varying levels of employee participation. This raises the question of standardisation and the number of ethnic groups to be considered. Whether the classifications adopted by the 2011 Census are adopted or otherwise, it is abundantly clear that, to obtain a useful and reliable dataset from which employers can make meaningful proposals, a standardised list of ethnic groups will need to be developed and the use of such list enforced when introducing mandatory reporting. The recent introduction of mandatory gender pay reporting has, mostly, been viewed positively and accordingly the introduction of mandatory ethnicity pay reporting is a promising addition, however neither datasets should be assessed in isolation. This is recognised in the consultation paper, which refers to several factors to consider. Geographical variations will be of particular importance when looking at data for employers with offices in multiple locations as different ethnic minority groups tend to be concentrated around certain locations, particularly central London. Gender variations are equally as important – some cultures consisting predominantly of a single or small number of ethnic minority groups are more predisposed to fewer female members at work, for example. The ability to dissect ethnicity pay data with gender pay data could create a more detailed and accurate picture of the interplay between both gender and ethnicity, and allow a more targeted approach to combatting workplace discrimination. What about where disparities are identified? The importance of narratives should not be overlooked, particularly where there have been low participation rates limiting the quality of the reported data. However given the burden placed upon employers, if mandatory ethnicity pay reporting is brought in, some thought should be paid as to whether there should be a further obligation placed upon them to produce an action plan (as suggested in the consultation paper), at least during its infancy. Additionally, there is a question over the status of any action plan and who would identify and quantify any improvements claimed by employers. There is little doubt that, despite the financial burden of implementation, ethnicity pay reporting is a positive move. Nonetheless there are concerns which have been legitimately raised in relation to classification, clarity and what to report. This consultation paper aims to allay these concerns, but still leaves much to be decided. Despite a successful rollout of gender pay reporting, the complexity involved in collecting ethnicity pay data means that the proposal for mandatory reporting on this topic still has a long way to go before it can be considered a feasible option.